During my most recent visit to Italy, we briefly stopped in Florence on our way to visit the somewhat disappointing Cinque Terre. I had visited Florence once before many years ago with my best friend, and to be honest, we didn’t love it back then. We were on quick trip, just 3 nights in each city, a typical American run through a country. Rome had been exciting- a crazy mix of the ancient and modern within a city overflowing with tourists and locals alike. We had found Venice to be the dream everyone said it would be. The gondolas floating down the Grand Canal, Piazza San Marco full of pigeons (which look great for photos but mostly instill a fear you’ll be pooped on), and of course the famous Bridge of Sighs and Rialto Bridge. On the other hand, we were too young to fully appreciate Florence. We drank only to get drunk and prided ourselves as we soaked in the local culture with every slice of 1 euro pizza. 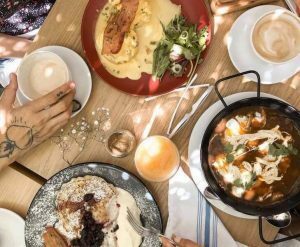 Returning now with a newfound appreciation of food and wine, and with tons of local advice from a friend living there, we were determined to make the best of our short time in the city. I’m not normally a coffee person but we were getting an early start and had a lot to do, so I indulged in the rare cup. Italian coffee culture is so serious- it’s nothing like America, where you have your venti iced caramel frappa soy milk lite foam something passed to you through a window. Italians sit and enjoy their coffee, chatting or reading the paper. Most everyone seemed to drink espresso, so I gave it a try. I was on a caffeine high for half the day afterwards. Sufficiently amped up, we hit the streets. My friend and I had both visited Venice before and had already checked off many of the “touristy things”. This time, we were happy to simply be in the city, walking the streets and exploring the shops. 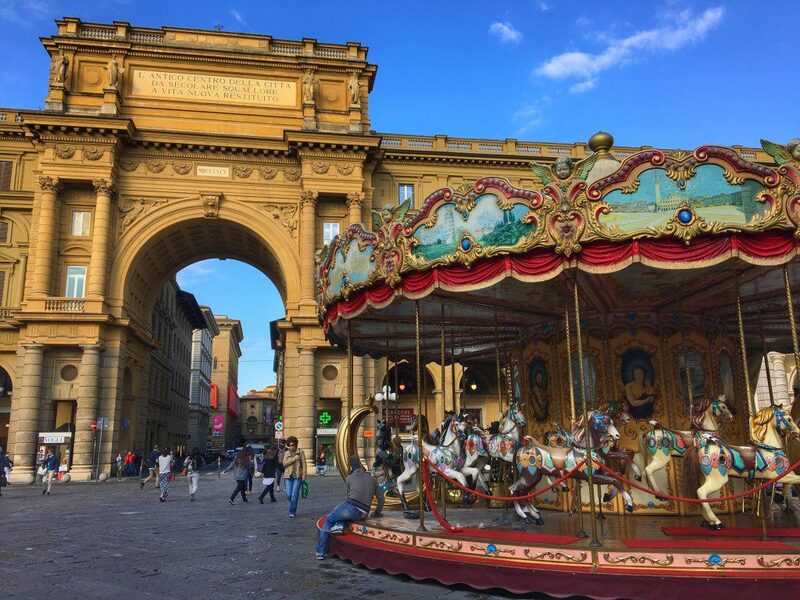 and the antique carousel in Piazza della Repubblica. We found endless Instagram moments that only Florence can provide. We considered visiting a few of the city’s museums, but the lines were too long to justify on our short visit. Pro tip: prebook your Uffizi/Accademia gallery tickets to avoid the lines. They can last an eternity, especially in high season. Fortunately, less than 5 minutes from the Uffizi was La Prosciutteria, my friend’s entry to our famed charcuterie challenge. 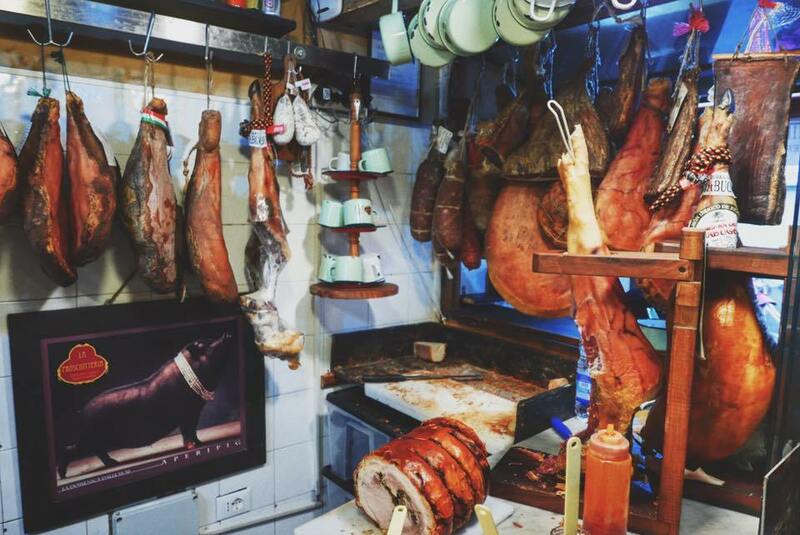 I knew when we stepped in and found the huge selection of hanging cured meats the place would be good. 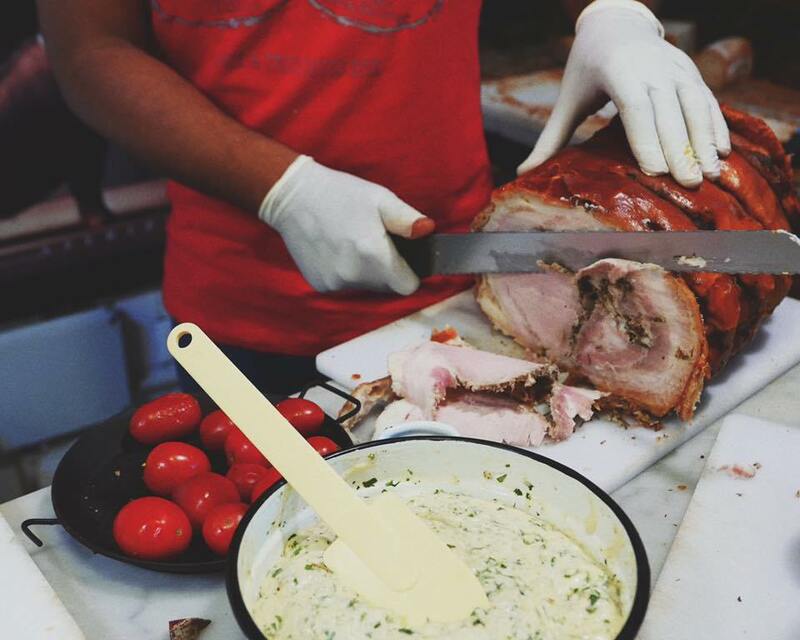 We watched as the workers sliced into porchetta, a perfectly roasted stuffed pork. We ordered the plate for two, grabbed a glass bottle of wine, and waited while the guys behind the counter expertly assembled our order. This lunch for two is so massive that they had to install wine holders on the wall, as the board is bigger than the table itself. I would love to tell you we couldn’t finish it, but I’m not here to lie to you. On my next visit to Florence I hope to take part in a proper foodie tour of Tuscany when I have more time. 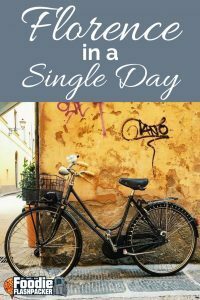 Now that we had gone from a caffeine high to an mid-afternoon wine buzz and uncomfortably full stomachs, we again hit the streets to walk it off. 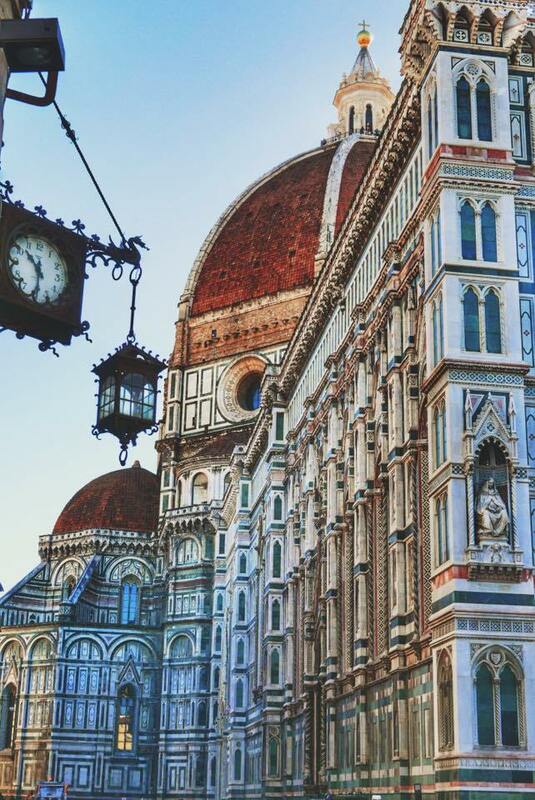 Florence truly has some of the most gorgeous architecture in all of Europe. 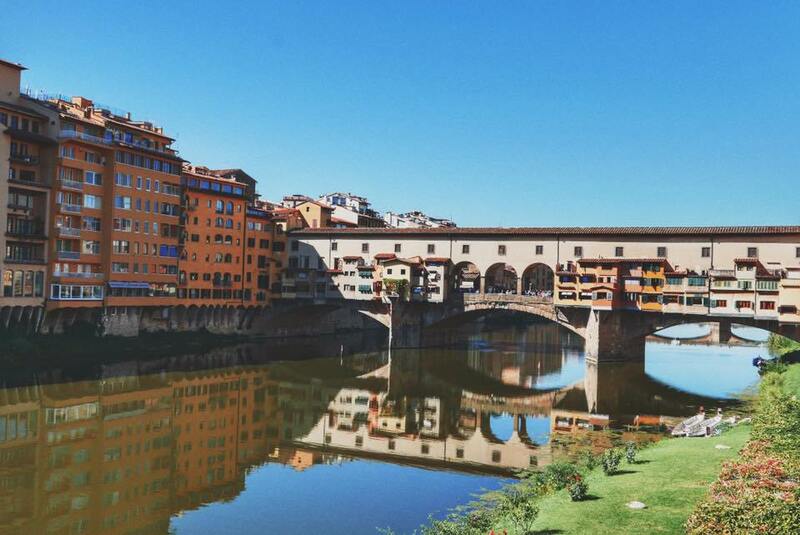 We strolled along the River Arno, admiring the Ponte Vecchio, or Old Bridge. We learned that until 1218, this was the only bridge across the river. As the sun began to set, we made our way back to our hotel to prepare for dinner, but not before finding more Instagram moments along the way. I was so excited for dinner because I had made plans to meet up with Georgette, who I met during my walking food tour of Marrakech. Georgette is a fellow American who has been living in Florence for many years. 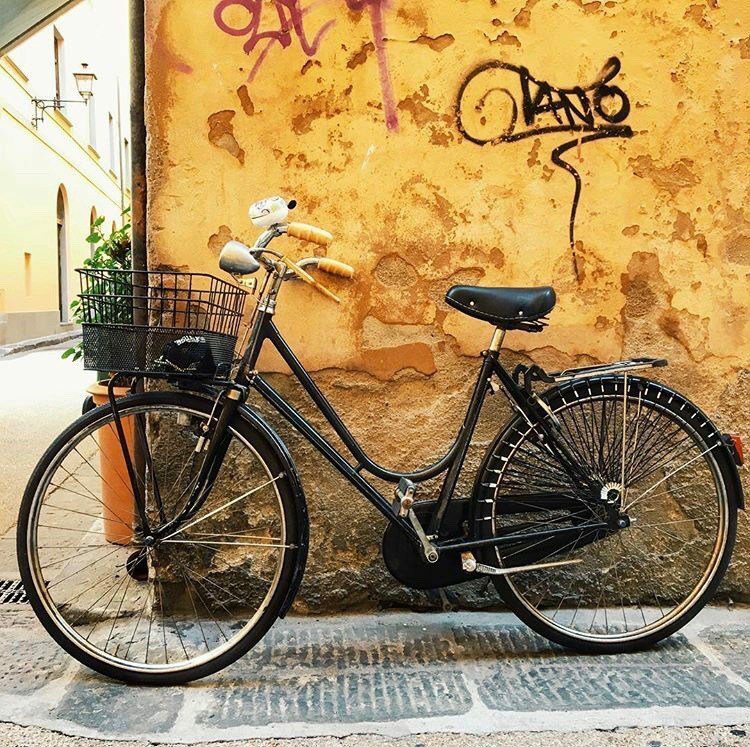 Her blog, Girl In Florence, is (and I’m not just saying this because she’s my friend) the best and only website you need to plan your visit to the city. She has thought of everything- where to eat, where to stay, the best cocktails, new restaurants- and she’s constantly updating the information. Sadly Georgette’s husband, who I also met on the tour in Marrakech, wasn’t able to join, so instead she brought along Coral, a friend who just happens to be a fellow food blogger and owner of a walking food tour company. I wish I had known about her walking food tours before I came, but I added them to my ever-growing list of reasons to return. Make sure to check them out when you’re planning your visit- the photos are drool worthy, and they are at the top of my list of things to do next time. Between a girl who had been living in the city long enough to be considered a local and a food blogger/walking food tour owner, I knew our dinner choice would be truly phenomenal. 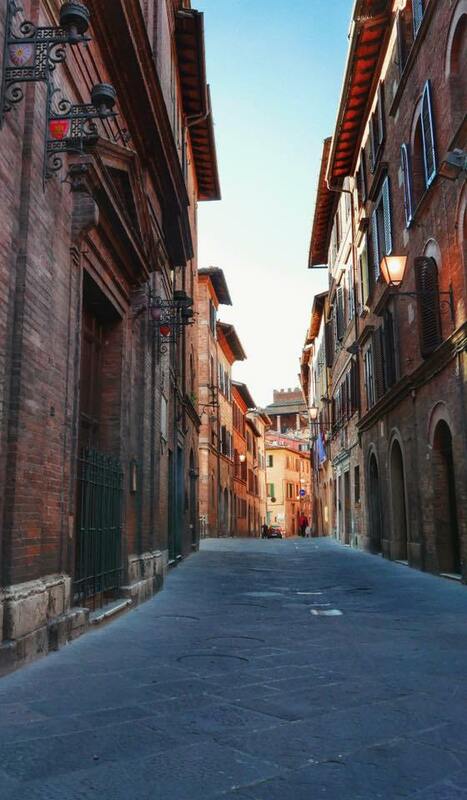 We met at I’ Brindellone, a place I never would have found had they not led me there. It was just so authentically Italian. If there was a menu in English, I didn’t see it. If the waiters spoke any English, I didn’t hear it. Knowing I was in good hands, I left the ordering to my friends. Soon, plate after plate began appearing on the table. I managed to snap a few pics before we dug in. These fried zucchini flowers were new to me but so delicious. Of course, because we were in Italy, we had to have pasta. 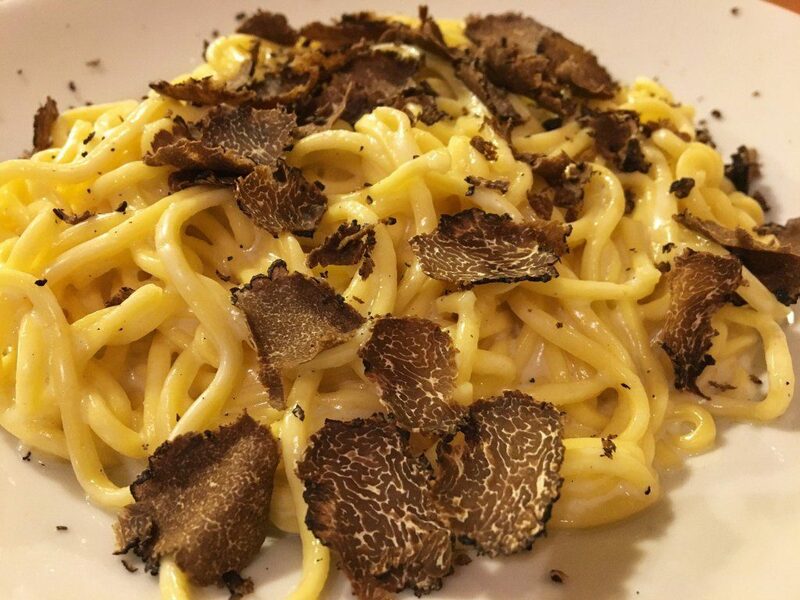 But not just any pasta, this pasta was covered in fresh truffles. We shared plates, emptied bottles of wine that kept being quietly replaced, argued politics, and laughed until our stomachs hurt. And then, the main dish arrived. 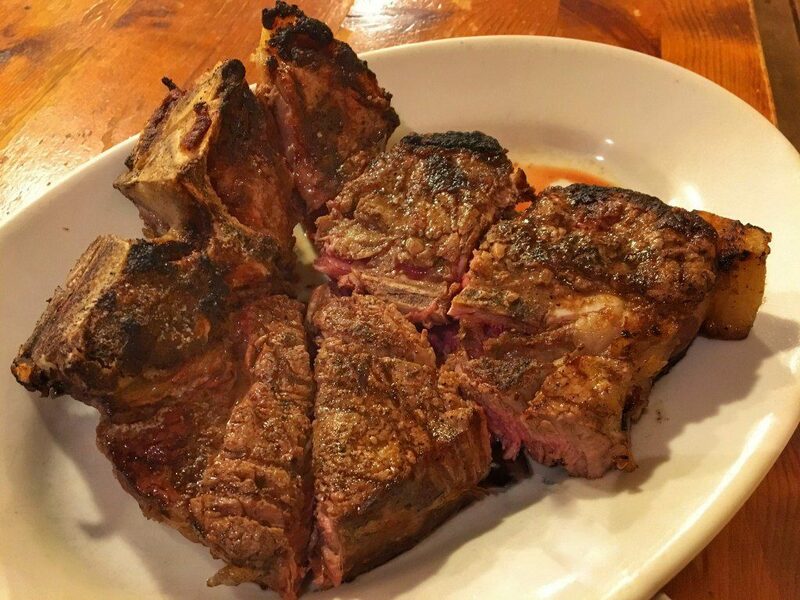 Bistecca alla Fiorentina, or Tuscan rare steak. I’m not sure if this photo accurately depicts how huge this steak is. It fed 6 of us. I was truly in my happy place. Full to the point of being nearly uncomfortable for the second time in a day, we made our way to Rasputin, a secret or hidden bar that reminded me of a retro speakeasy that sells designer cocktails. After a few more drinks, political arguments, and of course laughs, we called it a night because of our early departure the next day. I left Florence with a newfound appreciation of the city and the knowledge I’ll return, hopefully sooner rather than later, to further explore the city. And take that food tour of course! 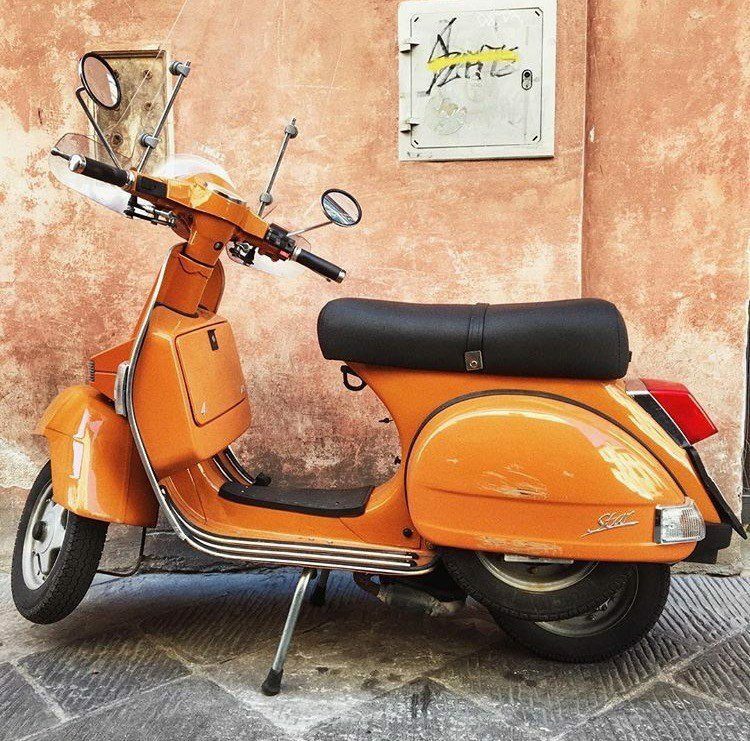 Have you ever visited Florence? What part was your favorite or looked best to you? Let me know in the comments section below! 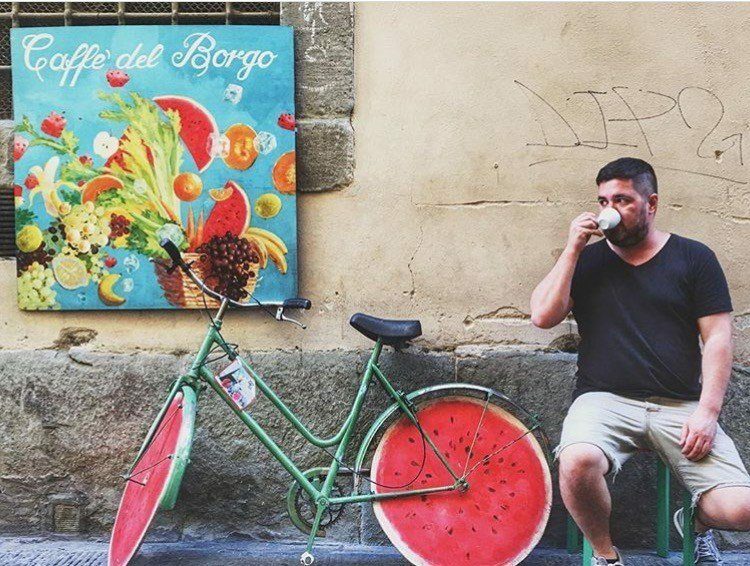 It’s great to have a tour like this Italy..Tasting local foods is always a great way to discover new places and it’s cultures. I am sure you must have a rocking time in the tour. Wild boar bolognese with fresh pappardelle on a piazza, and cocktails on a rooftop bar located on the river. Wild boar bolognese might be my favorite Italian dish ever! I kept wanting to try so many different dishes but I kept coming back to that one! I haven’t been yet, but I’d love to go. I like that you had a leisurely day of walking, enjoying coffee, dining, sometimes those are the best kind of days. The squash blossoms look amazing-one of my favs! With all of that food I would be in my happy place, too…and Florence to boot! That lunch looks like my kind of fare. Yum! You always find the best meals EVERYWHERE. 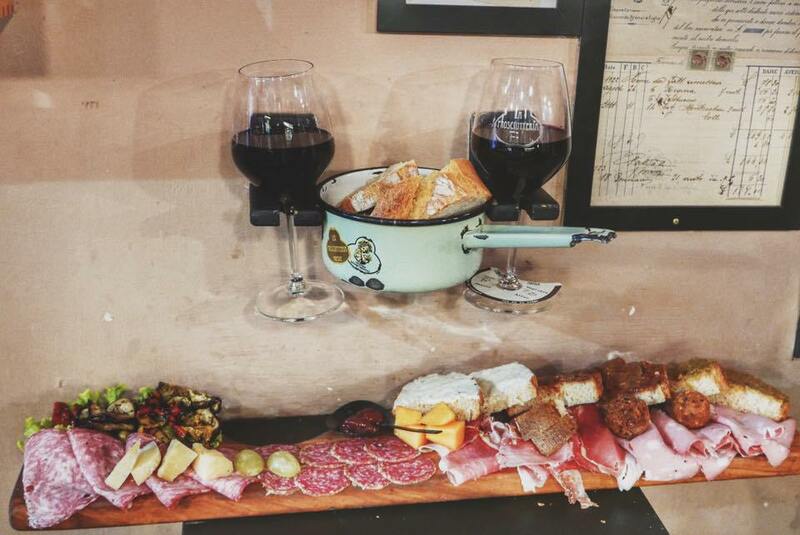 That charcuterie looks absolutely amazing and its hilarious that they needed a wall mounted wine holder! I too am not a coffee drinker but think if I went somewhere with such a great coffee culture as Italy would indulge in a cup or two. 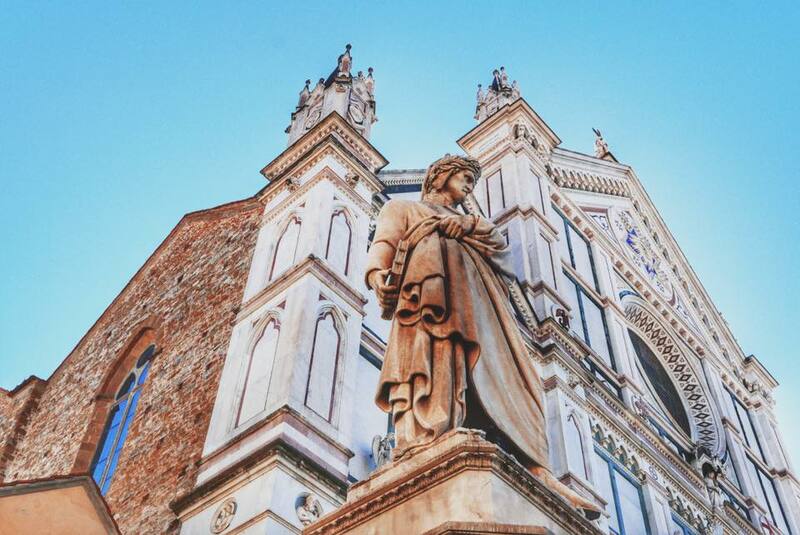 I’m definitely going to put Florence on the top of my Italy bucket list! Ooh, that porchetta looks amazing! My favourite place in Florence is the Bardini Gardens – beautiful flowers and even more beautiful views over the city. Haven’t been but would love to. It’s so different to visit a place when you are young and want to get drunk than when you visit again years later to actually sight see. The Cuomo building looks incrdible and simply walking the streets too. Florence is so wonderful! I loved the Piazza San Marco during my visit but I didn’t have any great foods like you did. 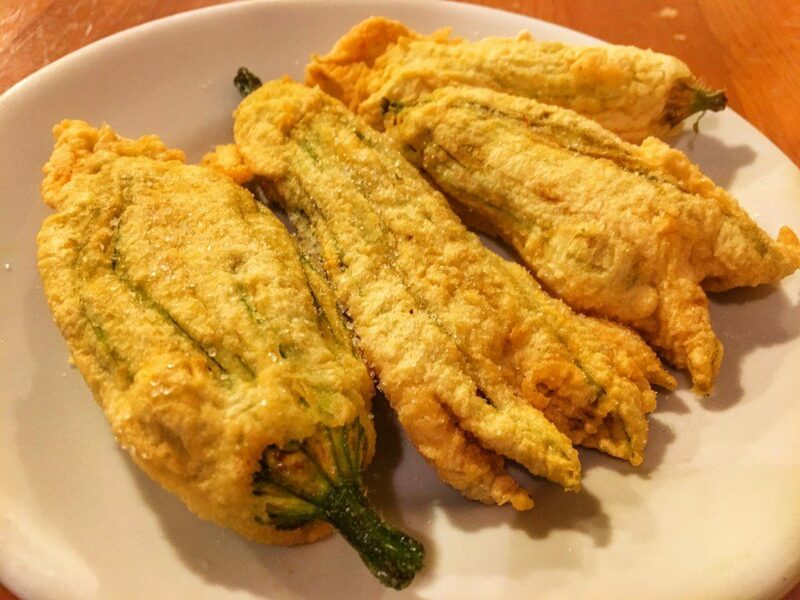 Those deep-fried zucchini flowers look amazing!! AND TRUFFLES! Lucky duck. The watermelon bike tires were so cute that I may have to look for some to decorate my bike with. I’m already full looking at that porchetta lunch. 🙂 I’d long wanted to visit Florence but I only had the sights in mind. Now, I have to include food to complete the list of must do’s in Florence. How delicious does that food look! I really want to visit Florence, it looks so beautiful and now I want to go to try that pasta with truffles. Yum! I’ve always wanted to visit Florence since my brother went not too long ago. Glad you got the chance to go again and see it in new light. Sometimes its more how we feel at the time I think! Thank you so much- I appreciate you saying that!